We’ve had a number of service calls in recent years that were initially diagnosed by the user as connectivity issues with their mobile devices or printers. After doing some diagnostics (remotely or on-site), we almost always were able to trace the issue to the wireless network in the facility. 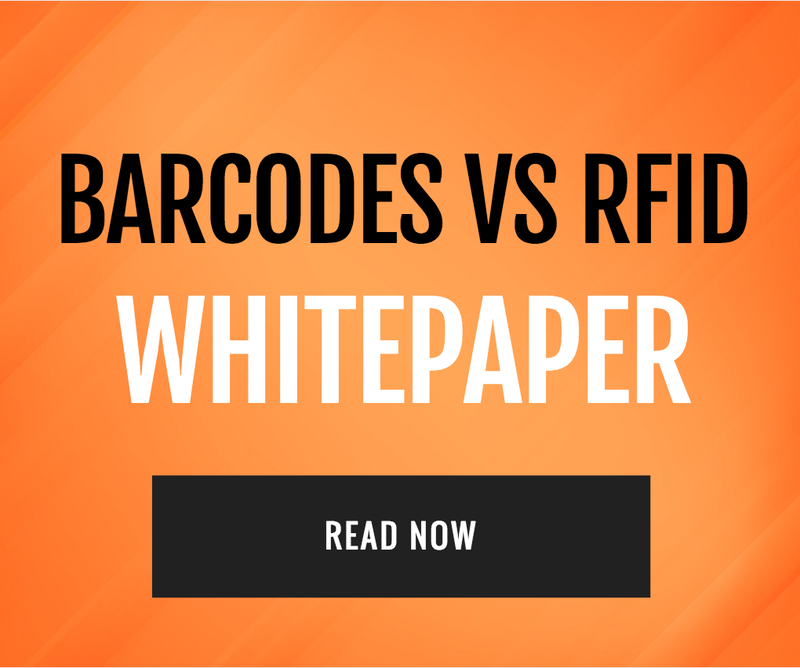 While these issues may occasionally result from problems with the access points themselves, the culprit almost always stems from misunderstanding how wireless performance and coverage challenges within the warehouse differ from an office environment. If you can only focus on one thing at a time, focus first on designing your wireless solution first. Anticipating these problems and addressing them in your planning will eliminate a lot of the other potential challenges you may experience in the day-to-day use and maintenance of your system. Inadequate or Non-Existent Site Surveys – Not just before installation, but before purchasing your equipment, a wireless site survey needs to be performed. The three main categories of site surveys are defined as Active, Passive or Spectrum, but choosing the most appropriate one (or more) for your solution depends on your physical site and your needs. Like much of this process, even if you have competent IT professionals who do this for your office, having a professional wireless provider who specializes in facility implementation is worth considering from this point already. The survey should take into account building materials, the layout of both the rooms and the racking (or planned to rack if not yet built), existing and future inventory levels, user and device counts, and the types of devices and applications that will be used. 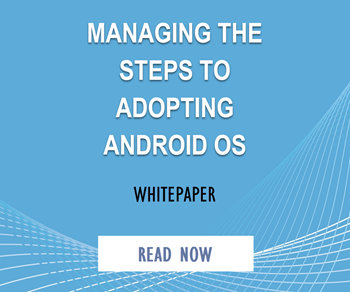 It’s best to include future plans in that as well if, for example, there is a new application or technology being considered a year to two out, an upgrade to your devices, or even a change in your OS (as many are experiencing now with the migration from Windows Mobile to Android). Proper Antenna Placement– The mounting direction of the antennas matter quite a bit in your DC. 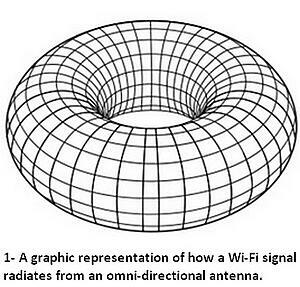 The way the omnidirectional antennas emit radio waves (outward in a circular shape) means that there is a donut hole created that will appear in unexpected places when the antenna is pointed at an angle somewhere in the warehouse. If there are racking, inventory and other equipment that may interfere with the signal, the impact of this will get exacerbated. Incorrect Antenna Type – One critical outcome of the site survey is to not only determine proper access point placement, but to identify the correct antenna for that environment. Directional antennae are used to focus into specific areas that have potential barriers that may create signal interruptions while Omni-directional antennae are designed to provide broad coverage over a broader open space. Too Many Access Points – While budget-conscious enterprises might suffer from an inadequate number of access points, the zealous connectivity enthusiast with a budget to match will sometimes install too many of them! 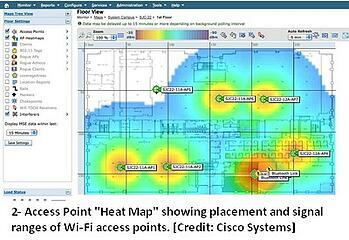 Access points in this scenario will potentially not only overlap, but result in poor quality as devices may be connecting to an access point farther away from where other devices are already using the bandwidth from it, while the closest access point goes unused. Newer systems allow for the power levels of each access point to be adjusted automatically, which takes some of the guesswork out of the more complex areas of the solution design. Getting the installation right is one thing, but there are other challenges that stem from how your wireless infrastructure is used and maintained. While all Wi-Fi might be the same in the office or warehouse for the user sitting in a room with a laptop or cell phone, the working environment out on the floor of the warehouse presents an entirely different environment that needs to be taken into consideration not only at installation time, but in its day-to-day use. Mobility Makes a Moving Target – the “Internet of Things” may get more attention and discussion in the office cubicles, but the actual implementation work is racing ahead in the DC well ahead of the rest of the enterprise. Modern facilities now connect everything – and much of what is in your facility is moving. Forklifts, powered carts with laptops and barcode printers mounted on them, handheld devices, trucks in the yard and at the receiving or shipping dock, etc. might all be accessing your wireless system while moving, meaning they will be transitioning from one access point to the next, sometimes very rapidly. This is why the site survey is so important and why having a process-minded expert help you out with the installation. The “mobility” factor of the devices in a warehouse means you’ll need to account for both the coverage and device count differently than you would in an office environment. Interference and Barriers – while you may have planned for your racking and other things that could interfere with signals before installation, interference may still be a problem because of the way the metal or mesh “cages” that protect workers on some devices or work areas operate. 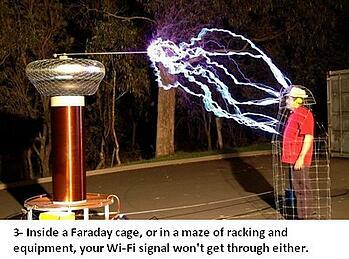 This follows the same principle as a Faraday Cage, (see photo), the concept of which is to “protect” what is inside, but the same thing that protects from one kind of wave also prevents the desirable ones from getting in too! It’s a good practice to make sure there are antennas extending outside of the cage and apply the same thinking to other parts of your facility where this effect may take place (i.e. locked “cage” areas for high-value SKUs, etc.). One additional aspect to consider is what you are stocking on your shelves. Even if the racks present no issues, the materials used and the density of what you store on them can have an impact too. A section full of metal boxes and cases will behave differently than an aisle full of shirts and sweaters. Beware the Firmware – Finally, firmware on your access points can wreak havoc on your network in two ways. New firmware often addresses bug fixes, contain new features, and protects you from security vulnerabilities. If you are out of date, you may experience interoperability and feature problems. 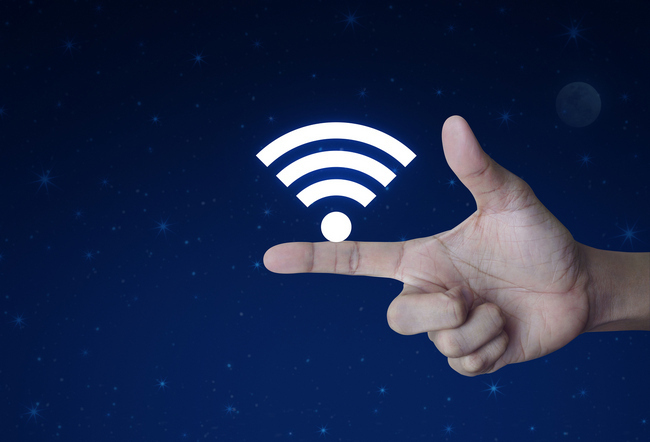 It’s important to stay up to date on both your access points and your wireless devices. In some cases, the actual update may cause problems too. For example, your devices may not seem to be connecting properly if your access points have been updated but your devices are not keeping up. Scheduling a regular check and update task as part of your solution maintenance can prevent these issues from occurring. If there is one thing in the insurance industry that we find applies very neatly to the world of Wi-Fi, it is what one industry executive once said, “Customers want to just get their insurance, and then forget about it…”. Wi-Fi is no different in that everyone wants to come in every day under the assumption they won’t even need to think about it. While your internal teams may have excelled at getting the front-office Wi-Fi installed and running smoothly, it won’t necessarily be any easier to repeat the feat in a warehouse setting. There will be more complexity, variables, and variety of devices and layouts than a typical office, so it pays to get the training or have a specialist assist with your installation.